By Dan Ambrose: Michael Katsidis (27-4, 22 KO’s) moves up in weight to the light welterweight division this Saturday night against Michael Lozada (38-8-1, 30 KO’s) in a 10 round tune-up bout at the Gold Coast Convention Centre, Broadbeach, Queensland, Australia. Katsidis, 30, is trying to end a two fight losing streak to rebuild his career at 140. Katsidis has been beaten badly in fights against Juan Manuel Marquez last November in a 9th round TKO and then by a 12 round decision to Robert Guerrero last April. However, the 5’7″ Katsidis feels that he’ll be stronger at 140, and with his powerful brawling style, he could find himself among one of the most exciting fighters in the weight class. There’s going to be room for Katsidis with Devon Alexander, Amir Khan and Timothy Bradley moving up in weight to the welterweight division. But first Katisidis has to prove that he can compete at the weight by beating Lozada. This will will be a good test for Katsidis, as Lozada can punch a little and could give a good indication of whether Katsidis can fight at this weight. Lozada has problems against fighters that can punch and has been beaten by guys like Paulie Malignaggi, Jorge Barrios, Jorge Louis Teron and Pier Olivier Cote by knockout. Katsidis will have to unload on him to take him out. He can’t leave Lozada hanging around to test his own chin because he’s taken a lot of punishment recently and doesn’t need to be in another tough fight right now. 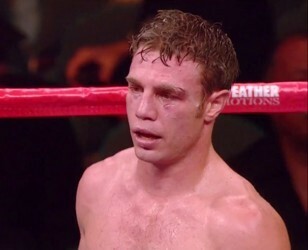 Katsidis is going to have to develop his right hand if he wants to make a name for himself at light welterweight. He’s got little power with his right, and is way too over reliant on his left hook.